This is one of those ideas so good that I wish I’d had it myself: risotto with brie. It is lusciously creamy in a way that the hard cheese we usually use for risotto just can’t match. 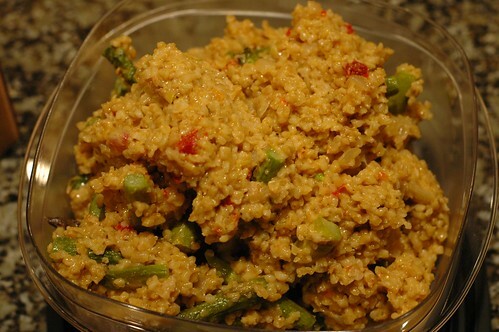 To stand up to that creaminess, this recipe uses bulgur wheat instead of rice, along with tender roasted asparagus and snappy sun-dried tomatoes. Give this a try even if you don’t especially like the flavor of brie: it’s a relatively small amount and lends more creaminess than flavor. It comes together in about 40 minutes and reheats well in the microwave. Snap the bottom of the stems off of the asparagus. Doing this by hand means that it will break where it becomes tender, which is perfect. Throw out or compost the bottoms and chop the tops into roughly two-inch segments. Put the asparagus on a rimmed baking sheet or in a 9×13 pan, making sure it’s spread in a single layer. Melt the butter and add 1 T. of olive oil. Drizzle over the asparagus and toss to coat, then sprinkle with a generous pinch of salt. Roast for about 15 minutes, stirring once, until the asparagus is tender and starting to brown. While the asparagus is roasting, mince the onion. Chop the sun-dried tomatoes into tiny pieces — try using kitchen shears if you have them — and set aside. Then remove the rind from the brie and cut it into cubes, and set that aside too. Heat the rest of the olive oil in a saute or saucepan over medium heat. Add the onion and cook until softened, about five minutes. It’s a little prettier in the end if you don’t let it brown, but it tastes fine either way. Then add the bulgur and stir to coat the grains with the oil. Cook for a couple of minutes to slightly toast it. Add one cup of the stock or broth. Cook, stirring occasionally, until it is mostly absorbed. Continue adding stock, half to one cup at a time, for about 15 minutes, or until you’ve used four cups of stock. Then you need to start tasting. When cooked, the bulgur is more tender than al dente pasta; the texture is almost like brown rice. It could take up to half an hour and six cups of stock for it to get there — among other things, bulgur can be ground coarsely or finely, which changes the cooking time. Trust your tounge! When the bulgur is done, add the asparagus, the sun-dried tomatoes, and the brie. Stir until the brie is largely melted, then remove from the heat. Season with black pepper, then taste and add more salt as desired. *If you’re not using oil-packed tomatoes here, rehydrate them in boiling water until soft.